Revised format makes it cleaner and more straightforward for RJC members to use. Revised format, making it cleaner and more straightforward to use. Added guidance to help you understand the requirements in the Code of Practices (COP). Capacity to identify your company’s activities beyond the RJC designated forums, making the questions even more specific to you. A built-in corrective action template to help you close out your non-conformances before your audit. Technical upgrade, making it easier to work with the workbook in its excel format. Getting ready for your RJC audit? Use the self-assessment workbook to prepare for your RJC audit. Conducting a comprehensive self-assessment of your business activities with the workbook allows you to understand your current compliance with all relevant RJC COP requirements. Closing any gaps that you identify before the RJC audit ensures you can feel confident in your company’s performance and leads to a successful certification outcome. Where can I find the new self-assessment workbook? 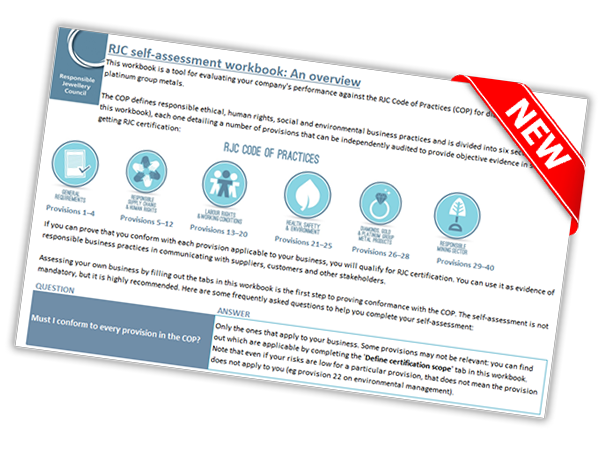 The new version of the self-assessment workbook alongside guidance such as an FAQ, can be found on the RJC website. There’s also a new short video to help you understand how to use the workbook. To assist even more of our members, we’ve produced the workbook in French, German, Gujarati, Italian and Russian, available on the webpage. "The revision of the self-assessment workbook is proof that we are listening and are working hard to ensure our members benefit from the support and guidance provided by the RJC. This is just another step we’ve taken to help our members achieve their RJC certification goals,” says Chinelo Etiaba, Director, Membership Services. If you’ve already begun your self-assessment using a previous version, please do not worry. The assessment questions and core content of the workbook remain the same, and by using either one diligently, you will prepare sufficiently for your RJC audit.